Was the antichrist really religious? As his authorship drew to its close, shortly before his sanity gave out, Nietzsche concluded that Christianity was "the one great curse, the one great intrinsic depravity," and "the one immortal blemish of mankind." Because these sentiments were not untypical of him; because they were couched in literature of such distinctive quality; because his ideas have had such an enormous impact; because one can report them to people in any sphere of life who have neither read nor even heard of Nietzsche and find them instantly recognized as a summary of attitudes they encounter, embrace, or fear, their author has been widely regarded as the foremost anti-Christian writer Europe has produced. In the early days of a new millennium, we may recall that, with a joyful sobriety too disciplined to cross the border into sheer abandoned intoxication, this self-styled antichrist wrote in his greatest work, Thus Spoke Zarathustra, of the bliss of pressing one's hand "upon millennia as upon wax" and writing "upon the will of millennia as upon metal." 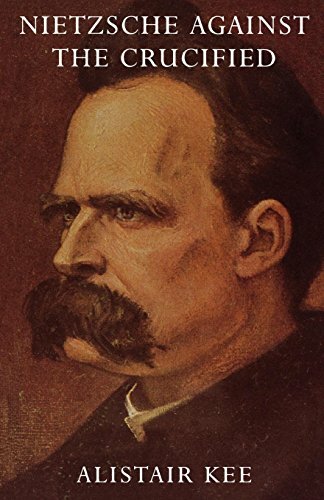 What if we need to correct our account of Nietzsche? What if the literature has avoided or missed important and positive things he has to say about religion, even about Christianity? What if Nietzsche found a friend in Jesus? Alistair Kee, of the University of Edinburgh, strikes out in the direction of answering these questions in his provocative book, Nietzsche Against the Crucified.